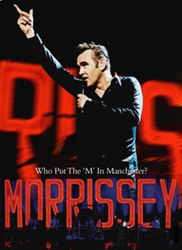 "Who Put The M In Manchester"
This concert was filmed on Morrissey's 45th anniversary on 22 May 2004 at the M.E.N. in Manchester by Bucky Fukumoto. The full concert is included. See gigography for concert details. The release of this live DVD was preceded by public screenings in select American cities in late March. For the occasion, "How Soon Is Now?" recorded at the Reading Festival in the summer of 2004 was also shown. The European, Argentinean and Brazilian editions are found in a standard DVD case. 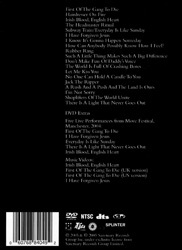 The American edition is in a DVD-digipack. The Russian edition is in a 'super-dvd-case'. The Chinese edition comes in a slipcase. UK: A promo DVD-r was produced for promotion of this release in the UK (SVE4010). It was usually distributed with a press release. Japan: Promo editions of the Japanese DVD have a red and white promo sticker over the barcode. USA: Advance DVDs with the same catalogue number were used for limited promotion. These were blank with only an info sticker (title and release date) on them and on the jewel case.